Yamaha Corporation subsidiary Revolabs will showcase its YVC-1000MS Microphone and Speaker System certified for Skype for Business at Microsoft Tech Summits in Washington, DC, March 5-6 and San Francisco, March 19-20. "The Microsoft Tech Summit is where cloud engineers and IT managers go to learn and share ideas about how to get the most out of the Microsoft cloud,” said Phil Marechal, vice president of business development and product management at Revolabs. “Because Skype for Business continues to be the platform of choice for collaboration, there's no better place for us to highlight the benefits of our speakerphone system, which meets Skype for Business' stringent certification standards. Engineers who incorporate our YVC-1000MS gear into their organizations' UC infrastructures will help their users be more productive thanks to clear and natural-sounding Skype conversations in every meeting space, large or small." The Yamaha YVC-1000MS is a USB and Bluetooth speakerphone and Yamaha's first product certified for Skype for Business. The microphone and speaker system passed Skype for Business Certification Version 3 tests—Microsoft's highest standards—providing natural, clear audio that defines the platform's meeting experience. The scalable and flexible YVC-1000MS solution is engineered to support the audio requirements of large meeting rooms, rooms with special table configurations, and even remote education classes or seminars within the Skype for Business application. The YVC-1000MS features separate microphone and speaker units that integrate audio for comfortable remote communication. Yamaha's adaptive echo cancellation and other sound processing technologies facilitate a stress-free conversation. 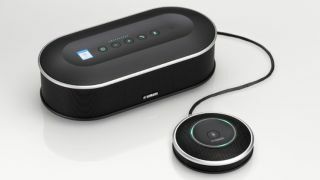 The user-friendly design provides fast connection to a call on a smartphone by Bluetooth and can bridge to a Skype for Business call via USB.